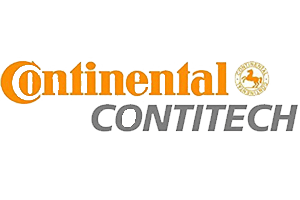 Acculinear belts can be used in open end or spliced configurations in a variety of applications. Typical applications for open end are in linear motion devices and other drives where precise motion is required. Typical application for the spliced configuration are in light conveyors and other material processing and transfer industries. When it comes to performance, Acculinear belts and sprockets are right on track. Acculinear combines the advantages of polyurethane with the unique Helical Offset Tooth (H.O.T.) 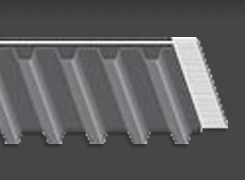 profile for a low maintenance belt that resists wear. Polyurethane belts resist flaking, offer high resistance to oils, fats and greases and are more abrasion-resistant than rubber products. The key to success lies in the system’s patented H.O.T. geometry. 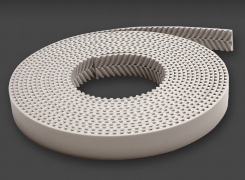 With this self-tracking configuration, the sprockets left and right helix’s guide the thermoplastic polyurethane belt to the center of the Acculinear sprocket. And there it remains: no waste, no wander, just improved efficiency and wear resistance in a compact design. The H.O.T. geometry eliminates belt wander and the need for flanges. As a result, Acculinear sprockets can be used on slider bed applications where flanges would normally protrude above the bed surface. Acculinear and the H.O.T design minimize belt vibration on flat pulleys used on the entry and exit of slider beds. The belt moves progressively over straight edges, reducing noise and vibration. The tooth geometry eliminates the cordial effect that occurs around the tooth sprocket and reduces drive vibration. 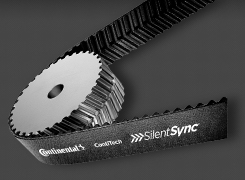 This innovative polyurethane belt and sprocket system uses our proprietary technology to deliver noise levels far below the industry standard. The unique H.O.T. design of the Acculinear system is the reason for the superior noise reduction. The tooth and backing material are made of thermoplastic polyurethane, which provides superior wear and abrasion resistance. It is an ideal choice in applications where cleanliness is critical. The precise manufacturing process, coupled with the polyurethane belt material, ensures a reliable and dimensionally stable product. The tension members are high tensile steel and offer dimensional stability for accurate positioning and less maintenance. The tooth facing offers reduced coefficient of friction with the sprocket and also provides wear and abrasion protection. 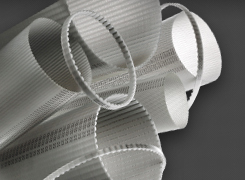 Manufactured in open end rolls with a standard roll length of 300 feet. The belt is manufactured with the tension members lying parallel to the belt edge so that the load is equally distributed across all tension members. A common application of open end belts is in linear motion drives. Clamping plates are available for open end Acculinear belts to mechanically join the belts ends.